A friend once said to Archibald Brown that the sermons he found most helpful and enjoyable were simple sermons. 'What do you mean by a simple sermon? ', his pastor replied. The answer was, 'One that is all about the Lord.' 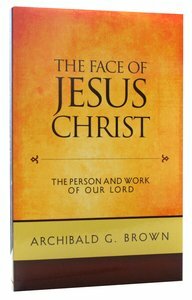 This book contains many of Archibald Brown's outstanding sermons on the Person and Work of Christ. It takes the reader to the heart of Brown's ministry with an attractiveness and relevance that will never dim. About "The Face of Jesus Christ"